When it comes to the aesthetics of the 1971 Plymouth Superbird you either love it or hate it. Which ever side you land on one thing is undeniable, it is unique. The Superbird is a rare and thus sought after muscle car restoration project. It was only produced in 70-71. Pristine and fully restored it can fetch north of $100,000 at auction. In an oft repeated theme on this blog, NASCAR had a hand in this one. In that era NASCAR demanded that race vehicles be made available to the general public in limited numbers. In 1970 they hiked the requirement from 500 vehicles to one in every two U.S. manufacturer dealerships. For Plymouth this worked out to 1,920 Superbirds produced. 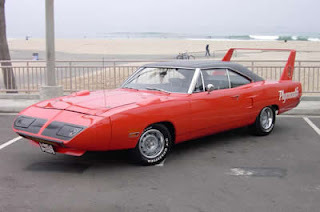 The Superbird was a highly-modified version of Plymouth’s Road Runner. The standout features included an extended nosecone and high-arching rear spoiler both aimed at refining the cars aerodynamics. The mathematic equation used to determine the hieght of the spoiler was the stuff of Urban Legend for 30+ years. But, then in the 1990’s a retired project engineer admitted the deflating truth; the height was chosen to give the trunk room to open without restriction. Under the hood the Superbird boasted a Magnum 440 cubic inch V-8 that produced 375 horsepower during dyno runs. As if that wasn’t enough Plymouth offered two “upgrade” engine models. Fun Fact: The Superbird was produced in large part to lure Richard Petty back to the Plymouth racing team.